Troels Brandt came to Greenland in 1938 and drew and painted portraits of Greenlanders and Danes. 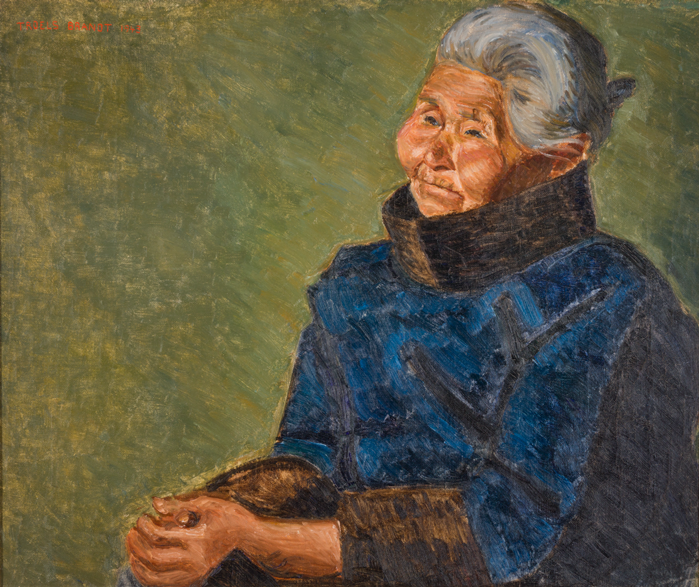 At Nuuk Art Museum, you will find two paintings by him: the portraits of two Greenlanders. The artworks are painted with thick and visible brushstrokes, but are at the same time very detailed. Going up close, you will discover that the various surfaces do not consist of just one colour, but many. So these paintings are in a way figurative, in their subject and their recognisability, but in the broad strokes and many nuances of colour they also get closer to dissolution and abstraction. Troels Brandt received his diploma from the Art Academy in Copenhagen; in 1938 he came to Qeqertarsuaq to work for the magister Morten P. Porsild at the Arctic Station, where among other things he was to draw plants. He was supposed to travel back to Denmark in 1940, but the war raging in Europe at the time caused him to stay for another five years. From 1940 to 1943, he worked in different places on the west coast of Greenland. In 1943 he was hired as a controller in Qassiarsuk, near the American base in Narsarsuaq. He went back to Denmark in the fall of 1945, but visited Greenland repeatedly later on. He found his models in the local area. In his diary (which was published as a book by Atuagkat) no mention is to be found that the portraits were done on a commission basis. Nor are there any broader reflections around his portraits or his art in general – it is most often a simple registration that he had now drawn this or that person. One of Nuuk Art Museum’s portraits is of a man on a bright background. It is Edvard from Narsaq. It was painted in November 1941 in Qaqortoq. Troels Brandt has played with light and the shadows in Edvard’s hair. Looking closely, you will find that the hair is almost a glowing dark blue today; there is no way of knowing if it has been this blue from the beginning. The other portrait is a grey-haired elderly woman on a matte green background – a sort of odd choice for a background colour, which is often repeated in many of Brandts portraits. It was painted in 1943 in Igaliko and the woman is Inger Olsen. * Troels Brandt, Dagbog fra Grønland 1938-1945, Forlaget Atuagkat, 1999.